How often do you see a video on Facebook but you can't turn the sound on to watch? Or, you see a post and want to remember it for later (like a recipe or maybe a post your competitor is doing...)? This happens to me all.the.time! 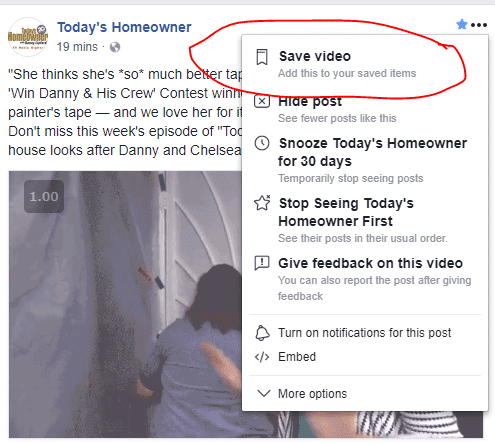 The way I get around that (and feel organized AND save time) is to save those videos and/or posts for later. Facebook knows this is a common problem and they have a solution. Perhaps you already know about this and use it. But, in case you don't - I thought I'd share. Step 1: Find a post you want to save for later. In this example we've got a post from Today's Homeowner. This screenshot shows you the three little dots that appear in the upper right corner of the post. This works the same on the Facebook app as it does on desktop. Step 2: Save the post. So, you clicked the three little dots as displayed above. Then, all you have to do is select "Save video". If it's not a video post - then it will say Save post. It works exactly the same. Step 3: When you have time, access your saved stuff. 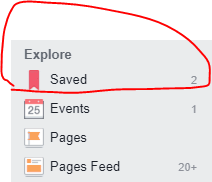 If you're on a desktop/laptop/computer, on the left side of your Facebook feed, about halfway down the menu you'll see the Explore option. Saved shows up at the top of my list. Click on that and you'll be taken to all your saved stuff. You can create categories in your Saved section if you really wanted to organize your stuff. But, I find that takes more time and dedication than I'm willing to give to the cause. I just want my videos when I want them! This one is going to be up to you. If all of your time is maximized now, you'll just feel more organized and have access to your saved stuff when you allocate time. Personally, I like to watch my saved videos while I'm making breakfast. You could watch them while you're on the treadmill. Lots of options! I hope this simple tip was helpful for you! If you have any questions or feedback, you're welcome to message me at hello@savvyagent.co.